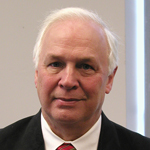 Dr. David (Ed) Crow joined the department in 2002 after a distinguished career in industry. Dr. Crow joined Pratt & Whitney in 1966, rising to the position of Senior Vice President of Pratt & Whitney’s Engineering organization in May 1997, where he was responsible for the design, development, validation and certification of all Pratt & Whitney large commercial engines, military engines and rocket products. He also led the research and development of advanced technologies systems to meet future aircraft requirements. Dr. Crow previously held the position of Senior Vice President for Pratt & Whitney’s Large Commercial Engines organization which included the PW4000 and JT9D high thrust family of products. Professor Crow is a past secretary of the Society of Automotive Engineers, and a member of both ASME and AIAA. In addition to serving as past president of Pi Tau Sigma, he has served on the Engineering Advisory Board at Clarkson University and is an elected member of the University of Missouri-Rolla Academy of Mechanical Engineers. Dr. Crow graduated from the University of Missouri-Rolla with a B.S. in mechanical engineering and from the Rensselaer Polytechnic Institute with a M.S. in mechanical engineering. Professor Crow is a member of the National Academy of Engineering, elected for his leadership in the engineering design of high-bypass-ratio gas turbine engines for aircraft.